From “Crushing New Taxes” to “a step in the right direction,” social media leapt into action following the Supreme Court ruling last Thursday which let the Affordable Care Act stand – including the controversial element requiring all individuals to obtain health insurance by 2014. The response was passionate, and at first heavily tilted toward those in favor of the ruling, according to a special report by the Pew Research Center’s Project for Excellence in Journalism. But by the end of the weekend, the tenor of the conversation had changed as those in opposition became more vocal. 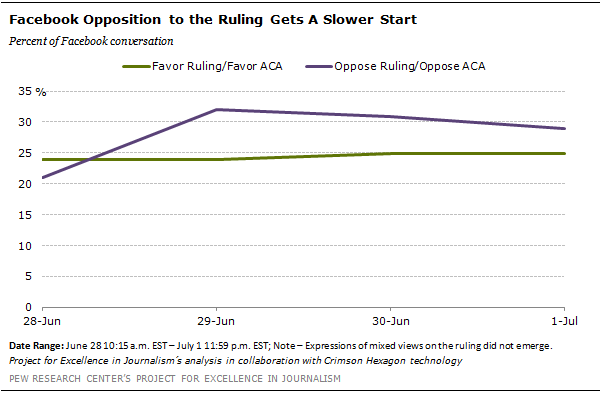 This sentiment matches closely the divided public opinion over the health care ruling. Each of the three platforms studied—Twitter, Facebook and blogs—came down in somewhat different places. On Twitter, where the conversation was by far the heaviest of the three platforms (some 2.1 million statements in all), users were evenly split between those who favored the ruling and those who opposed it (18% of the conversation voiced support for the ruling while 17% voiced opposition). On Facebook, dissenters slightly edged out those in favor (29% opposed and 25% in favor). 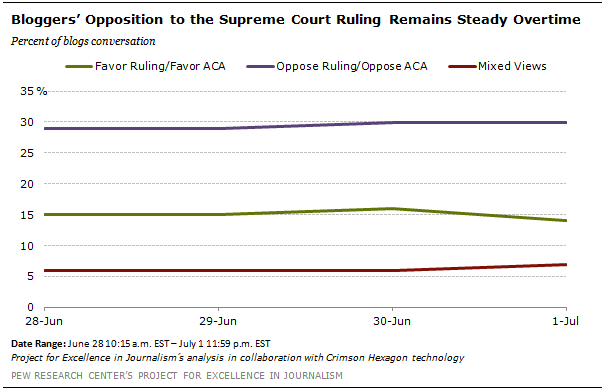 And in blogs, opposition to the ruling outweighed support by nearly two-to-one (29% opposed versus 15% in favor). These are some the findings of PEJ’s study of 2,133,392 statements on Twitter, 82,770 on Facebook and 20,459 on blogs from the time the ruling was announced, 10:15 a.m. Thursday June 28, through Sunday, July 1. Read the full methodology. On all three platforms the conversation focused much more on views about the ruling itself than about what it might mean for either of the presidential candidates. The gap was more than three-to-one on Twitter, five-to-one in blogs and more than five-to-one on Facebook. Among those who did discuss the presidential implications, views were statistically evenly split on which candidate it would help or hurt. 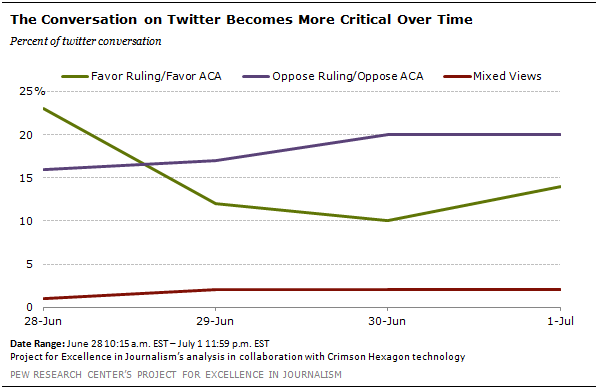 On Twitter, 5% of the conversation suggested it would help Obama or hurt Romney while 7% expressed the opposite. On Facebook the statements broke out to be 4% help Obama/hurt Romney and 6% help Romney/hurt Obama. On blogs, it was 5% of the statements for each. 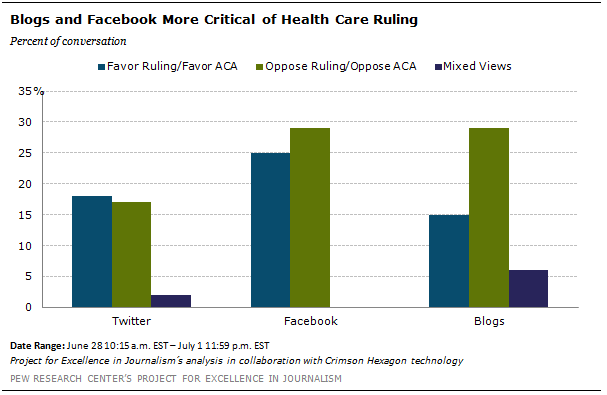 A handful of other aspects of the ruling gained traction in social media. 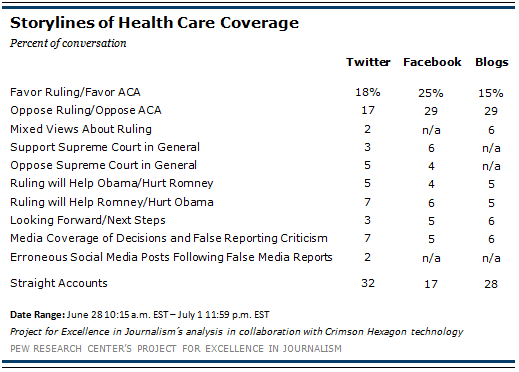 Views about the Supreme Court in general accounted for 8% of the posts on Twitter and 10% of the posts on Facebook. (This did not emerge as a clear frame on blogs.) Most of the comments centered on Justice Roberts, who sided with the liberal justices for the 5-4 ruling upholding the law and demonstrated again the split in Americans’ views. 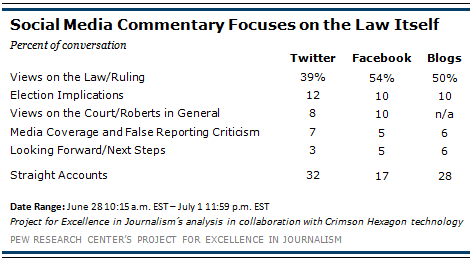 On Twitter, 3% of the statements praised the Supreme Court or Roberts while 5% criticized it. On Facebook the split was 6% commending and 4% critical. Another area of conversation centered on the media’s coverage of the ruling – in this case largely criticizing CNN and Fox which erroneously announced that the Court had struck down the law. The tenor of the conversation changed over the four days following the ruling. In the initial hours that followed, those cheering the ruling came out strong but dissenters picked up steam on Friday and through the weekend, and in the end outweighed supporters in two of the three social media platforms. The greatest shift occurred on Twitter. Supporters accounted for nearly a quarter (23%) of the conversation on Thursday, but then dropped in half on Friday to 12% and then to 10% on Saturday before inching back up on Sunday. Dissenting views rose steadily through Saturday and then leveled off. On the public Facebook feeds, statements in support of the ruling had a slight edge on Thursday (24% of the conversation versus 21% in opposition). But those angry with the ruling weighed in much more heavily on Friday, accounting for 32% of the statements, and then continued to outweigh supporting views over the weekend. Bloggers maintained the most consistent tone over the four days following the ruling, and that tone was one of opposition to the Court’s action. Across all four days, statements expressing disagreement with the Court’s ruling outweighed those in favor of it by two-to-one.